Calculates stored energy, usable energy and power dissipation in every possible wiring (parallel, serial) for a given number of capacitors range. This prevents from endless manual calculations. If not compatible values are detected, this software suggests calculated corrections for a feasible solution. Deliver all real variants due to REALISTIC ultracapacitors, otherwise than formulas which only delivers values without any refer to realistic and on market available ultracapacitors. Take into account the leakage current and possible power loss in load-balancing circuits, which may be relevant in very low power applications. Calculate with different ultracapacitor types and different voltage ranges to find the most efficient and most cost-effective design which meets your requirements. Add about 30% margin due to initial tolerances and possible capacitance changes. If you have a buck, boost or buck-boost converter in your design: Don't forget to add the power loss from your . Calculated values are based on specified load and voltage (Pload, Vapplicationmin and Vcapmax) range. Other loads and voltage ranges results in other results. Temperature effects, lifetime and tolerances: Refer to the ultracapacitor datasheet. This behavior depends directly on the Vcapmax, which you can set in this software. inventlab LLC gives no guarantee for calculated results. Capacitor name: The name of the capacitor, it is only for the identification if you later compare different capacitor results. Capacity: The Capacity in Farad of the capacitor. Max. voltage: The maximum Voltage the Capacitor accepts. Normal ultracapacitor have values between about 2.3V and 2.85V. This value is for warning, if your design exceeds this max. voltage. 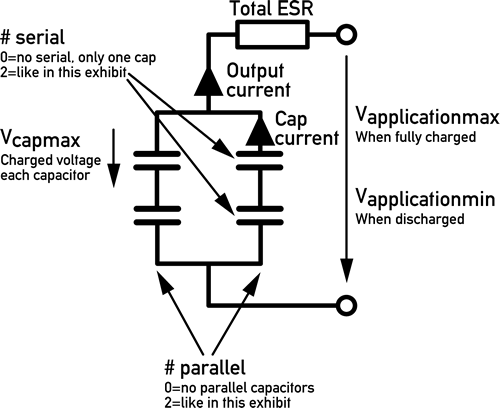 ESR: The internal series resistor of the capacitor. This value is very important, in particular at high loads. Max. current: The max. current the supercapacitor can provide without damage. This value is for warnings, if a calculated design exceeds this value. Price: The price of one capacitor. This is for calculating the price of the number of capacitors and for calculating the cost of one usable stored Joule. If you are looking for the most cost effective design variant, set a realistic price at a realistic order quantity. Vapplicationmin: This is the stop-voltage of your design. You will discharge the supercaps to the this minimum voltage. This is the voltage when the maximum current will flow in constant power applications. Set this value to a voltage that a acceptable current flows and that it fits for your design. Vcapmax: This is the max voltage you want charge EACH capacitor. This value must be lower than the capacitor's max. voltage. Note: The total max. voltage (Vapplicationmax) of the design variants will be calculated depending on the different wiring possibilities and number of capacitors. Pload: Your constant load power consumption. # caps min: The minimum number of capacitors you want to calculate width. # parallel: Number of Capacitors in parallel for this design. 0 means no parallel capacitors. 2 means two capacitors in parallel. # serial: Number of capacitors in serial for this design. 0 means no serial capacitors, 2 means two capacitors in series. Total capacity:Total capacity for the calculated design. Vapplicationmax:The design's max voltage. Depending on the Application-specification's Vcapmax and design's # serial. Cap current max: The max current which will flow through EACH capacitor (alone). Total ESR: The total ESR resistance of this design variant design. Energy between Vapplicationmin and Vapplicationmax: The stored energy between the two voltages. Initial ESR voltage drop: The initial voltage drop which will be occur when the load will start take current. This is may be specifically relevant if your design is a buffer for high loads. Then you need to know the initial voltage drop. Final ESR voltage drop: The voltage drop @Vapplicationmin. This is the voltage drop when the highest current flows through the capacitors and it's ESRs. This may be specifically relevant when you disconnect your load, because the voltage will increase by this value. Make sure your switch-off-circuit has an anough high hysteresis to prevent from oscillating. Energy loss due to ESR: The not-usable energy which will be lost in capacitors total-ESR over the discharging process while the discharging time at the specified Pload. Usable energy: The real usable energy in this design @Pload in the specified voltage range (Vapplicationmax and Vapplicationmin) over the constant power discharging process. Expected running time @Pload: The expected running time with this design. Total energy loss each cap: The total energy dissipation in each capacitor. Note: This is the discharging-ESR-dissipation and NOT the difference between total stored energy and usable energy. Usable energy each cap: Usable energy each capacitor under the specified conditions. Price per usable Joule: The price for one usable stored Joule. This shold be as low as possble to get the most cost-effective design. Depends on the price you specified for one capacitor. inventlab LLC is specialized in ultracapacitor based ups solutions. Feel free to contact us and give us a feedback about this software.